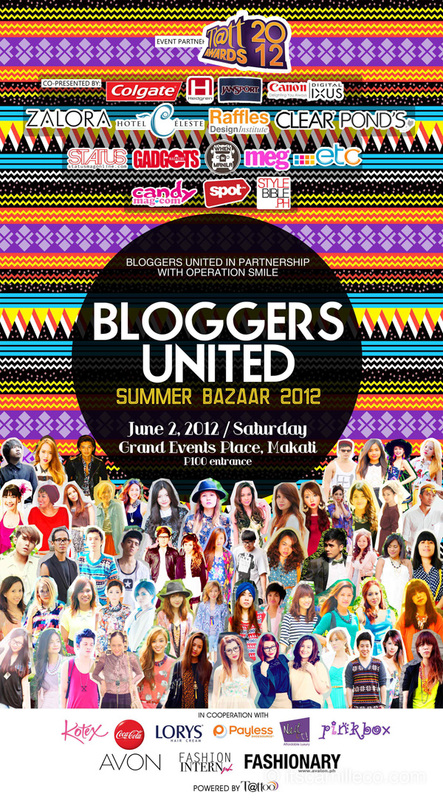 See You at Bloggers United 3! So will I see you at the Grandview Events Place, Makati tomorrow? Tickets will be sold at the venue for PhP 100 each. Drop by anytime between 11am til 9pm! You’ll not only shop til you drop but you’ll surely enjoy all the games and prizes BU3 has prepared for you! See you there!!! you really inspired so many people not only in fashion but in other aspects also.. :) good luck po.. Thank you Sarah! Wish ko rin! Meeting other bloggers and seeing you camille co is my dream. :) Sana makaattend po ako sa mga BU :”> I wanted to buy some stuffs from famous bloggers. If ever I’ll be back in the Philippines from Riyadh, I hope for another BU.. I WON’T LET MYSELF MISS THAT… I’m a fashionista too.. and blogging made me more inspired when in comes to clothing..
15 lng po ako.. :) Pero inlove ako sa mga damit :) spoiled kasi kay mama eh.. Thanks Jean! :) I hope you come back! Please have this event here in Cebu. Graveh jampacked! Di ako masyado naka-buy ng gamit sa stall mo. Super dami ng tao! Huhuhu. (T_T) Sa space niyo ni Laureen. Waaaah! Awwww bakitttttt :( Sayang naman! I sold a few brand new ones too! Hii! Are you also selling brand new items?  btw. See you laterr!! Awwwwwwww I really wanna see you there. But because I cant go now. So I’ll be going on december! Bloggers united 4. Promise! And please let’s have a picture <33333333333 Im so excited!! Awww so sorry I had to leave! I was with my sister and I didn’t want her to wait for me for so long. :( I’m a size 7. Hi! may I know the address of the venue? Grandview Events Place is at 3rd Floor, 1012 Buma Bldg. Metropolitan Avenue, Makati City. It’s at 3rd Floor, 1012 Buma Bldg. Metropolitan Ave., Makati. The bazaar is always there ba? Or you guys change venues on every Bloggers United event? *Cries* This is really sad. Went to the last day of Superb, and really spent alot. I should’ve waited for this pala sana, mas madami ako mabibili dito. :((((( Too little too late lang ang peg ko. I think so! :) Haha I love the “hindi masyado makasalanan gumastos” Lol! Hi Camille, Hope I can meet you tom at BU3!I’mexcited!! :) May I know what time will it start?I just wanna make sure i’ll be first in the line :D Thanks! Hi Cams, will there be a cut-off for the selling of tickets? whew :) btw are u size 9-10 (hope yes)?Coz your shoes will be my target! yah saw it on twitter when I was already planning to come. sad..
hi camille! may i ask the address of the bazaar. im not familiar where grand events place is. regards. Grandview Events Place is at 3rd Floor, 1012 Buma Bldg. Metropolitan Avenue, Makati. I saw on Twitter that you’re selling your Ipad 1 32GB? I guess you’re planning to buy the new Ipad 3. Are you selling it for 18k? Does it come with the Marc by Marc Jacobs casing too? hehe :D May I know how much you’re selling your BB Torch? Follow up question! Are you going to sell too your SPERRY TOPSIDER shoes (the shiny grey one)? I saw you wore it only once in Lookbook eh. Definitely gonna be there.. unless I get lost trying to find the place. XD Am curious about ze gadgets you got up for sale. i want your ysl shoes! haha. Haha never going to sell them! Size 7. But I’m selling a few of my sister’s shoes too. She’s a size 5. For sure there will be a BU4!